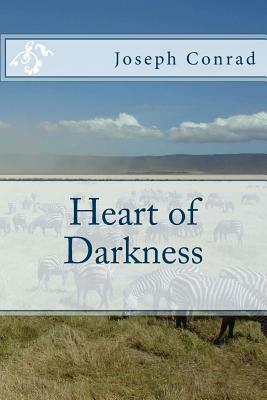 Heart of Darkness is a short novel written by Joseph Conrad, written as a frame narrative, about Charles Marlow's life as an ivory transporter down the Congo River in Central Africa. The river is "a mighty big river, that you could see on the map, resembling an immense snake uncoiled, with its head in the sea, its body at rest curving afar over a vast country, and its tail lost in the depths of the land." In the course of his travel in central Africa, Marlow becomes obsessed with Mr. Kurtz. The story is a complex exploration of the attitudes people hold on what constitutes a barbarian versus a civilized society and the attitudes on colonialism and racism that were part and parcel of European imperialism. Originally published as a three-part serial story, in Blackwood's Magazine, the novella Heart of Darkness has been variously published and translated into many languages. In 1998, the Modern Library ranked Heart of Darkness as the sixty-seventh of the hundred best novels in English of the twentieth century.